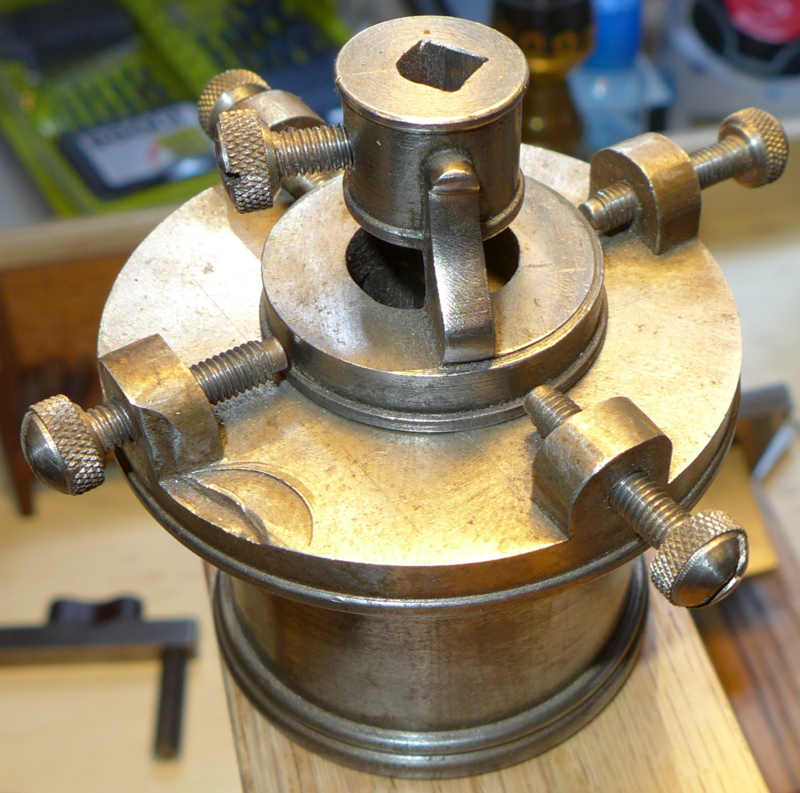 First, it would appear that Rudolf Koch just put the punch blank in a vise. This is attested in several illustrations, including the one below from a 1932 article in The Colophon. I'm sure he did it, and I'm sure it worked. But this just seems wrong - the punch is completely unsupported from below. 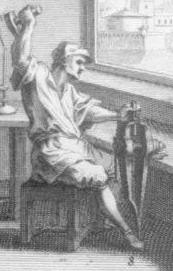 The illustrations don't even show Koch using a blacksmith's leg vise (designed to take blows), but rather an ordinary machinist's bench vise. But Koch was an artist working in a romantic tradition looking to an imagined past, not a trained industrial punchcutter. Does anyone know if there is evidence of this method being used in industrial practice? The first real fixture seems also to be the most practical: A simple box to hold the punch blank upright. Here is one made by Stan Nelson, shown in use by him. 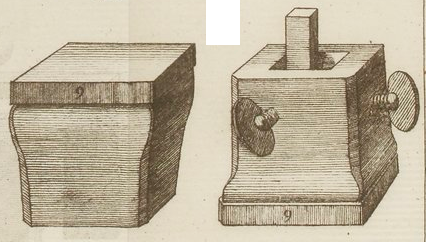 In this particular one, the "box" is solid at the bottom (the punch blank's lower (hammer) end is resting on the cast-iron bottom of the fixture, not on the anvil below the fixture). Note the safety goggles Stan is wearing. 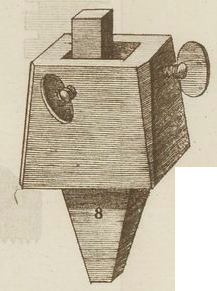 Getting fancier, here is the great English punchcutter Edward Philip Prince shown at a two-part counterpunching fixture. His hammer seems very light - but certainly he knew his business. This fixture seems to be mounted on a raised post on his punchcutting bench, right over one of the bench's legs. Prince was born in 1846, so this photograph would have been taken around 1921, about two years before he died. He was at that time still actively working as a professional punchcutter. This illustration is the frontispiece of Avis' 1967 biography of Prince. Here's a two-part counterpunching fixture made by Stan Nelson after the one in the photograph of Prince (but the two differ in the method used for adjusting the top portion - in this feature Stan's fixture more nearly resembles the one used by Paul Koch, shown later). 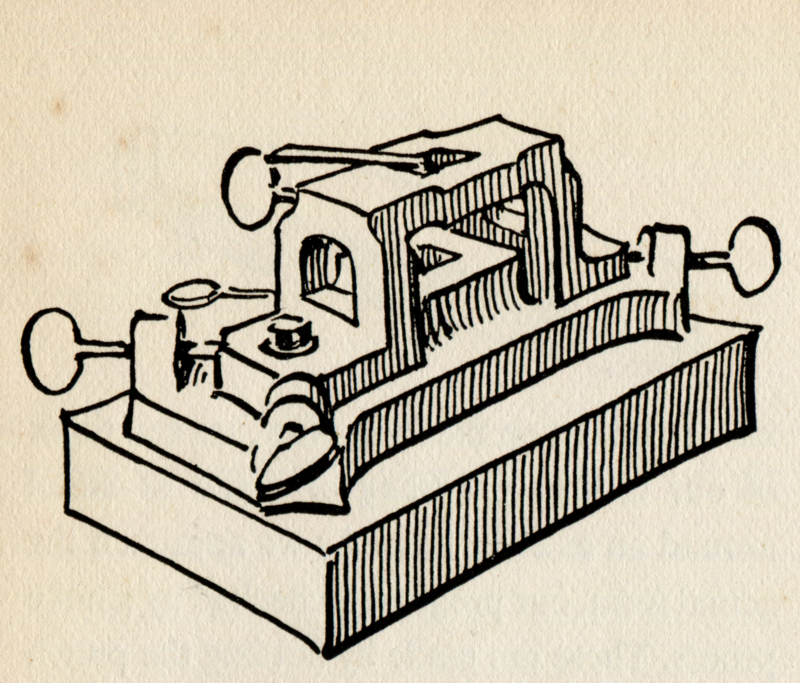 Finally, here is a slightly different two-part counterpunching fixture as illustrated by Fritz Kredel for Paul Koch's 1933 "Dolphin" article. 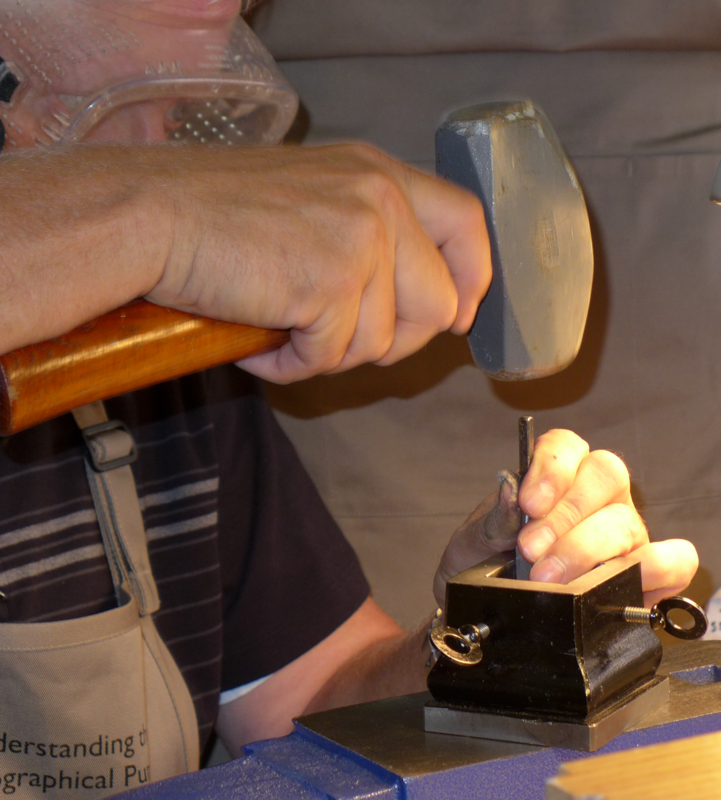 In it the fixture is held/balanced in the hand and only the hammer-end of the punch rests on the surface/anvil below. Kredel also illustrated a similar fixture in the specimen for Jessen Schrift (Klingspor, ca. 1934). 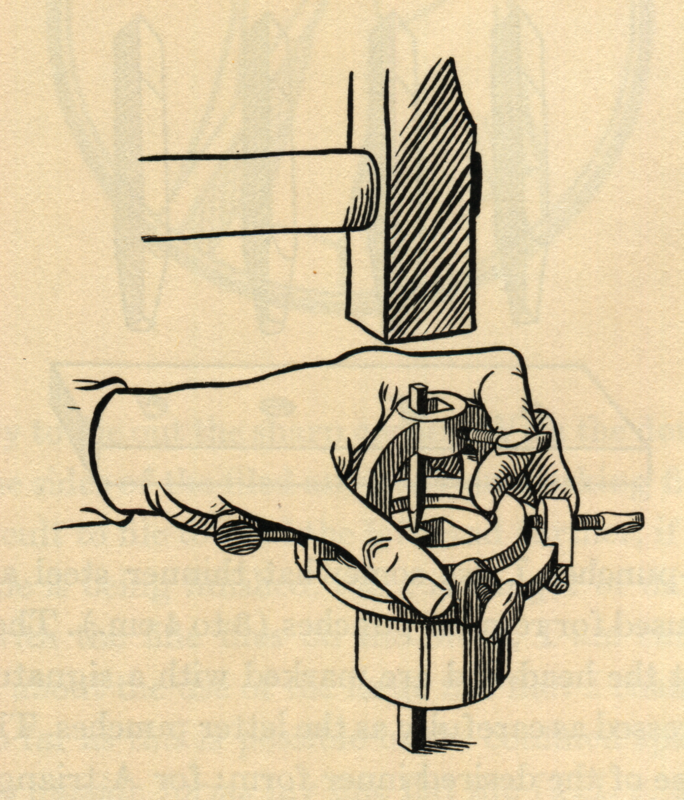 A fixture based on this appears in the scarce "Lehrtafel" series of instructional posters by Klingspor, but (if you have these) note that it probably contains an error. 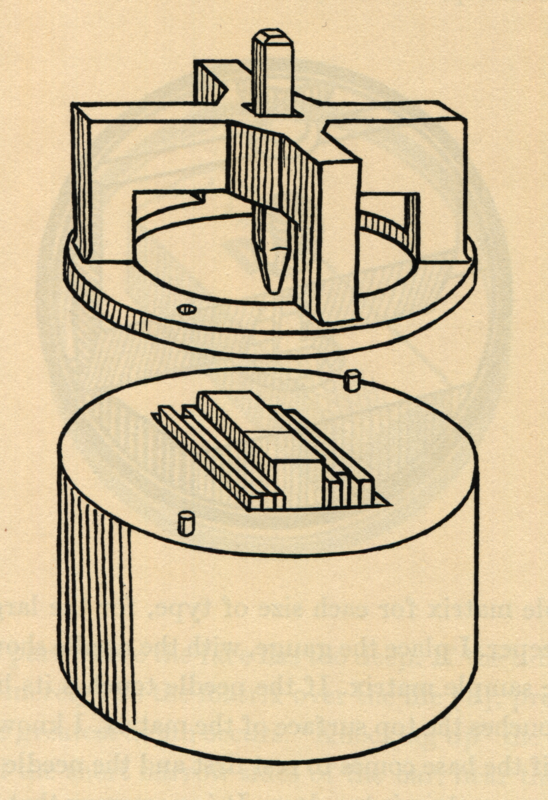 As shown there, the punch blank is supported on all sides by its adjusting screw. This would be most unstable. In all of the fixtures shown above the punch blank is firmly pressed against one side of the hole in the fixture. 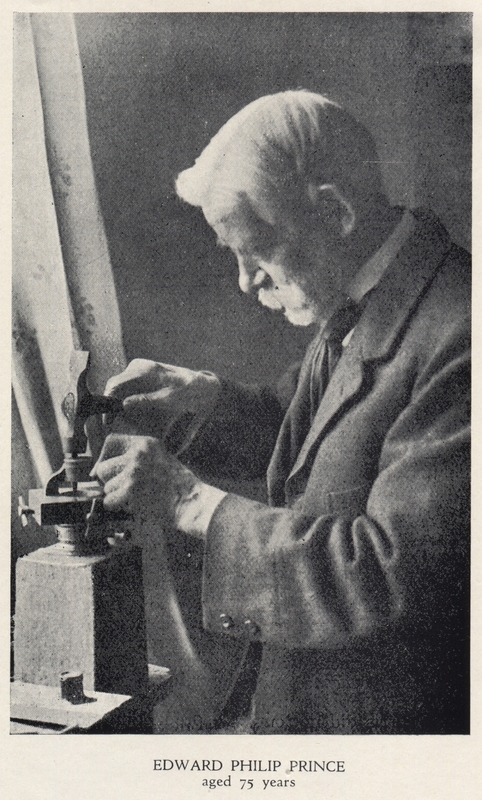 Well, I've checked a little more carefully and discovered that Rudolf Koch's method of just clamping the punch in the vise is in fact well attested - and in our two earliest-and-best sources at that. So I can now formulate "Rule 1" for posts about type-making: Never post anything about type-making without first re-reading Moxon. 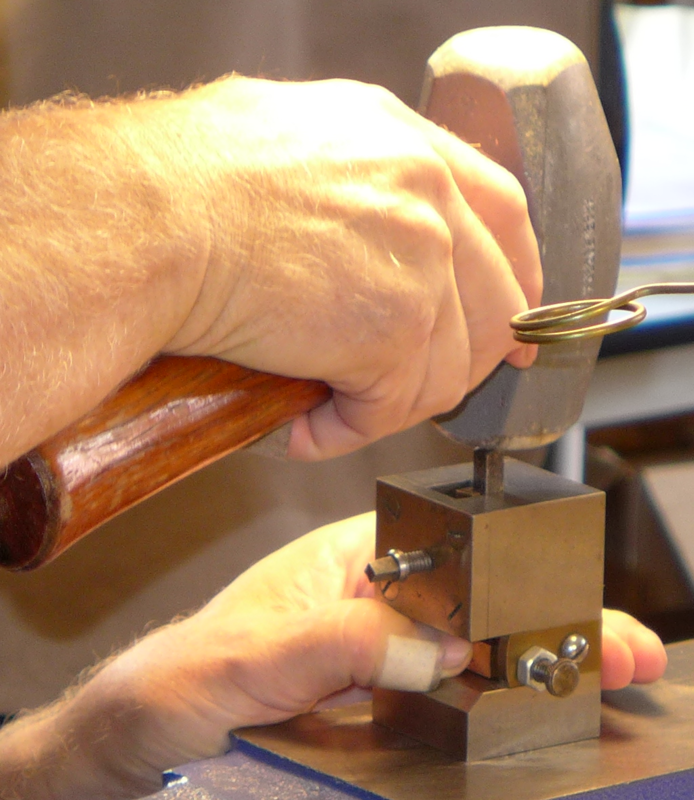 Yes, Moxon's method of counterpunching is to put the punch blank in the vise. 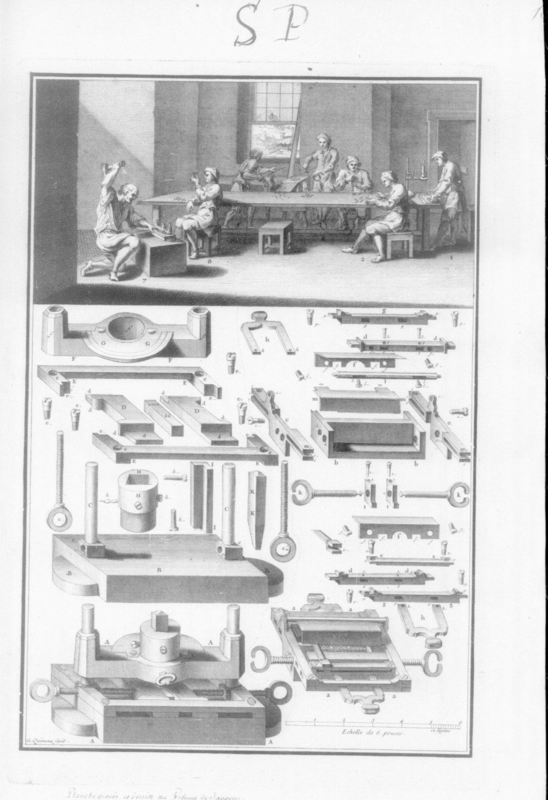 Fournier shows two styles of counterpunching fixtures (the second of which is the basis for Stan Nelson's). The second style also does double-duty as a "bench block" (as does Stan's). 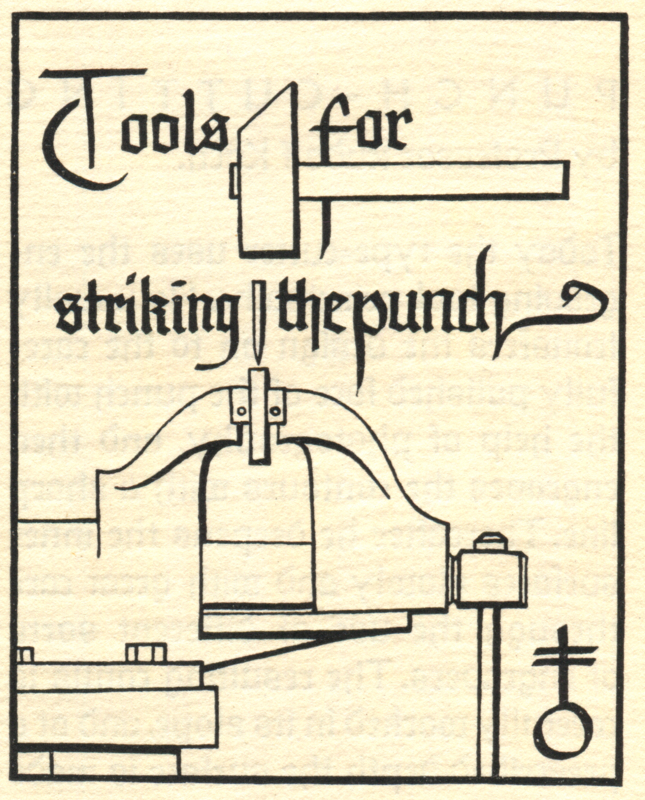 Finally, in 1953 Warren Chappell illustrates a slightly different version of the two-part fixture in his booklet "Let's Make a B for Bennett" (curiously, he doesn't show this style in the chapter on "Type: Cutting and Casting" in A Short History of the Printed Word (1970)). First (as an aside) a note of thanks to those who have been posting other material, questions, and comments. I feel a bit awkward posting so much here, but by complete chance I have access to quite a bit of good information that needs to be more widely distributed, and this forum seems an ideal method. I hope that the images of tools are of use (or at least of interest) and aren't swamping other discussions. On to matrix striking fixtures. These are not as well attested as counterpunching fixtures. Moxon did not know of them. Fournier knew of one (by Grandjean), but spoke ill of it and preferred to hold his punches by hand. The few fixtures I've seen or seen illustrated differ widely one from another. By the time most modern sources (such as Bohadti) came along, matrix striking by hand had been replaced by matrix driving by press. 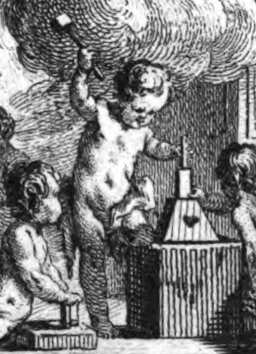 The earliest seems to be one designed by Grandjean and documented by Jaugeon in his unpublished manuscript of 1704. Here is the plate showing it. (It is shown in use in the top portion of the plate, on the left. In the bottom portion with the detailed parts views it is the instrument generally on the left. The instrument on the right is a matrix justification device (that Fournier didn't like either.)) The image here is from the Gallica/BNF digitization of BNF MS Fr 9158 and is licensed by them for noncommercial use only. If you want better versions of this image, you're going to have to find and purchase a copy of "Matrix" No. 11 (1991), which contains James Mosley's outstanding article about these plates. Search on "Matrix 11: A Review for Printers and Bibliophiles". Jumping forward over two centuries, here is a curious fixture shown in Paul Koch's "Dolphin" article. At first glance it resembles his counterpunching fixture, but it is reallly quite different. The punch is held in a fixed X-Y location in the top part, and the top part is held in a fixed X-Y position against the bottom part by two pins. Adjustment of side bearing is done by brass and typemetal shims (from leading and rule no doubt). 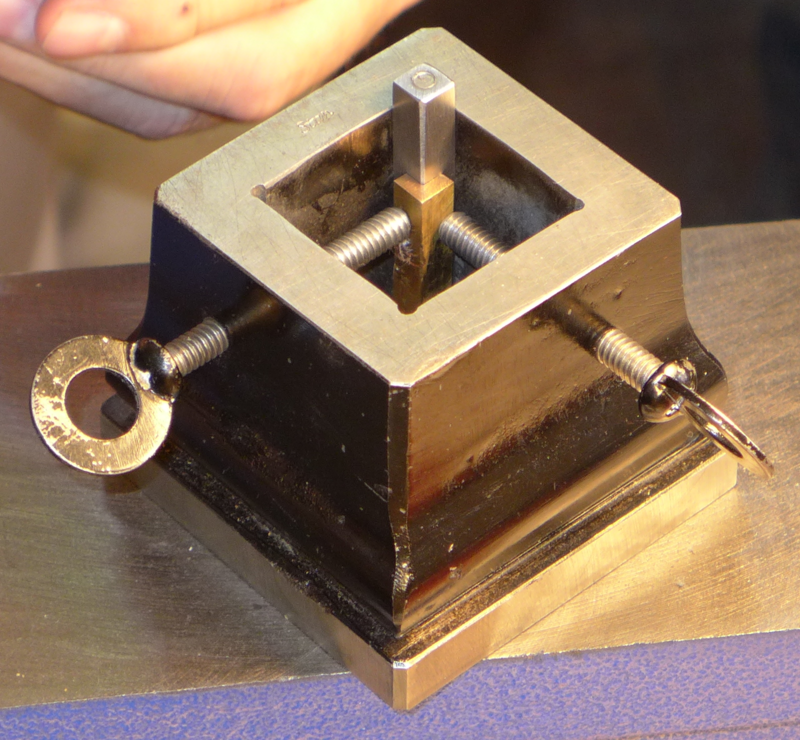 Adjustment of head bearing is done by sliding the matrix; there is no fixed or fixable stop. Finally, here is the fixture used by Stan Nelson. I do not know its origins (I should ask). He has been using it since at least 1985, because it is shown in his film "From Punch to Printing Type." (Do people know of this film? It is still available, now on DVD, and is well worth getting.) It allows the fine adjustment of head bearing by screw, but has no provision for adjusting side bearing (other than shims on either the punch or the matrix). Depending on one's casting equipment / matrix "gauge," though, side bearing can be relatively constant over a wide range of body sizes. For example, Lanston display matrices to 36 point all had the same side bearing, and Monotype English Display mats had only two different side bearings (and just one of these covered most of the body sizes). So this lack of adjustment for side bearing is probably a feature (simplifying the fixture) rather than a bug. @David MacMillan Many of your pictures are unique and the information you share is priceless so I don't think there will be complains. Thanks! >> here is a curious fixture shown in Paul Koch's "Dolphin" article. I couldn't find this instrument in my PDF version of such article. Are you sure the illustration comes from the same Paul Koch'a article? @David MacMillan Super! I've made another PDF with the images.